This page is where I collect all the posts I have written about the grande dame of British comic books, a publication named 2000 AD, and some posts about related titles, such as its glossy, high-brow, European-style stablemate Starlord. 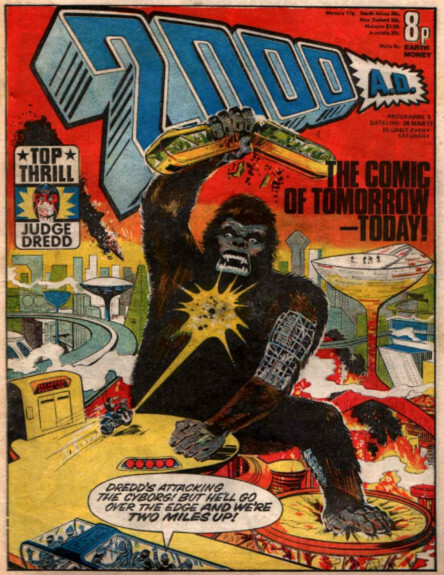 2000 AD was first published in 1977 as a swift cash-in project on the back of the huge popularity of Star Wars, and even though it had built in obsolescence with its then futuristic title, and even though the smart.money was on it disappearing after a few issues, it is still with us. At the time of writing, the publication has reached 2117 issues, and I intend to read all of them. All. Of. Them. And, not only that - I intend to write a blog post about every single, motherf**ing one of them. I don't have any particularly good reason to do this, nevertheless it shall be done. Some of that journey will be a lot of fun for me. I remember reading some of these issues when they were first published, so there is a nice taste of nostalgia, and there are some absolute classics, featuring creative talents who went on to become giants of comic book writing and art. Some of this journey will not be much fun, because 2000 AD, like any long-running publication, has some periods in its history where it lost its way. There are some diabolically bad issues out there to be read, and I shall read those ones, too. Anyway, now that the project has been outlined, here is a listing of the posts I have written thus far. Most posts are about 2000 AD, but some posts are about the various short-lived sister titles and are slotted in among them, at the appropriate point in the chronology. 2000 AD - Issue 0001 - The 70s boys comic book formula reworked with a sci-fi flavor. 2000 AD - Issue 0002 - Remember the Six Million Dollar Man? 2000 AD - Issue 0003 - A big geezer with a shotgun. 2000 AD - Issue 0004 - He upgrades to a pump-action shotgun. 2000 AD - Issue 0005 - Giant cyborg ape attacks future city. Hell yeah! 2000 AD - Issue 0006 - Good, solid, issue. 2000 AD - Issue 0007 - All action, all problematic, but a lot of fun. 2000 AD - Issue 0008 - A fat T-rex. 2000 AD - Issue 0009 - Dinopuncher. Starlord - Issue 01 - Stands up pretty well. Starlord - Issue 02 - Ripsnorting space opera. Starlord - Issue 03 - A cyborg t-rex. Starlord - Issue 04 - A bright spot among all the gloom. Starlord - Issue 05 - The most eye-catching cover yet. Starlord - Issue 06 - A great cover and three strong strips. Starlord - Issue 07 - Steeped in its time, this issue more than many. Starlord - Issue 08 - With a full-page color advert for Wagon Wheels. Starlord - Issue 09 - A doozy. Starlord - Issue 10 - With the Jackal Troopers. Starlord - Issue 11 - A strange one. Starlord - Issue 12 - A great issue. Starlord - Issue 13 - A beautiful Strontium Dog cover. Starlord - Issue 14 - Ardeni and Tilman find a planet to rest from their adventures. Starlord - Issue 15 - Quality stories. Starlord - Issue 16 - Ro-Jaws and Hammerstein cover. Starlord - Issue 17 - Average issue. Starlord - Issue 18 - Horrible, airbrushed cover. Starlord - Issue 19 - Haven't gotten round to it yet. Starlord - Issue 20 - One of Starlord's best covers. Starlord - Issue 21 - Cool Johnny Alpha poster. Starlord - Issue 22 - Sad day - Starlord ends its run. 2000 AD - Issue 0086 - Joins with Starlord. 2000 AD - Issue 0087 - Pleasantly savage. 2000 AD - Issue 0088 - Classic shark action. 2000 AD - Issue 0089 - Dredd gets a bullet to the head. 2000 AD - Issue 0090 - Tyrant Chief Judge Cal is Trump. 2000 AD - Issue 0091 - "M" for Manly. 2000 AD - Issue 0092 - Haven't gotten round to it yet. 2000 AD - Issue 0093 - Classic Ro-Jaws story. 2000 AD - Issue 0094 - Judge Cal cover (McMahon). 2000 AD - Issue 0095 - Bouffant 70s hair. 2000 AD - Issue 0096 - More echoes of Trump, before Trump. 2000 AD - Issues 0097 to 0105 - Haven't gotten round to them yet. 2000 AD - Issue 0106 - Grampus the giant alien crocodile. 2000 AD - Issue 0107 - The Death of Nelson at Trafalgar (but with robots). 2000 AD - Issues 0108 to 0122 - Haven't gotten round to them yet. 2000 AD - Issue 0123 - Deadlock's stupid little bike. 2000 AD - Issue 0124 - Excellent Dan Dare episode. 2000 AD - Issue 0125 - Powerful impression. 2000 AD - Issue 0126 - The last Starlord. 2000 AD - Issue 0127 - A feeling of betrayal. 2000 AD - Issues 0128 to 0244 - Haven't gotten round to them yet. 2000 AD - Issue 0245 - Filler. 2000 AD - Issue 0246 - Intriguing. 2000 AD - Issue 0247 - Shows its age. 2000 AD - Issue 0248 - Iconic cover. 2000 AD - Issue 0249 - Great cover. 2000 AD - Issue 0250 - Bitter-sweet. 2000 AD - Issue 0251 - Quite political. 2000 AD - Issue 0252 - Weird cover. 2000 AD - Issue 0253 - A lot of fun. 2000 AD - Issue 0254 - Vintage 2000 AD. 2000 AD - Issue 0255 - Very pleasing. 2000 AD - Issue 0256 - Nice cover. 2000 AD - Issue 0257 - Not great. 2000 AD - Issues 0258 to 0335 - Haven't gotten round to them yet. 2000 AD - Issue 0336 - Problematic. 2000 AD - Issue 0337 - A great issue, with great art, and much less problematic. 2000 AD - Issues 0338 to 2116 - Haven't gotten round to them yet. 2000 AD - Issue 2117 - Tempts me to jump back in. 2000 AD - Issue 2118 - Even better than last issue. 2000 AD - Issue 2119 - Hershey written out? Say it isn't so! 2000 AD - Issue 2120 - Now with added racism. (Not a good thing). 2000 AD - Issue 2121 - Not much better than last week. 2000 AD - Issue 2122 - A real return to form. Great issue. 2000 AD - Issue 2123 - Just enough of interest to keep me coming back.